Lahore, Sania Mirza, the Indian tennis star won the ladies double US Open tennis tournament, in which the Swiss player, Martina Hingis was her partner in the ladies double. 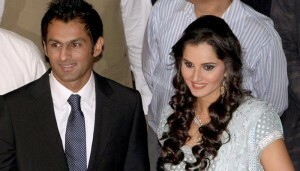 Her Pakistani husband and former Pakistani captain, Shoaib Malik is pleased with her victory in the tennis double match and he is also inspired with her victory. He said that he is inspired on the cricket field. She played the tennis tournament last week with her partner Martina Hingis. Both the players won the title of Wimbledon recently and this is their second consecutive victory in the tennis tournament. She got the title of number one in the ladies double in last April and she was the first Indian tennis player, who attained this position in tennis with former Grand slam singles champion, Martina Hingis. Their marriage was a high profile marriage, which was taken place in 2010. Shoaib Malik was pleased over her victory in the tennis tournament and he is feeling under pressure & he wants to perform well in the coming Zimbabwe tour of Pakistan. He is the member of Pakistan squad in the coming Zimbabwe tour and he will have to show his performance in the coming one day international and T20 international matches. He told media that her win in the US Open will inspire him in the Zimbabwe tour and he will feel extra pressure during the tour. Pakistan Zimbabwe cricket tour is going to be started from 27 September.